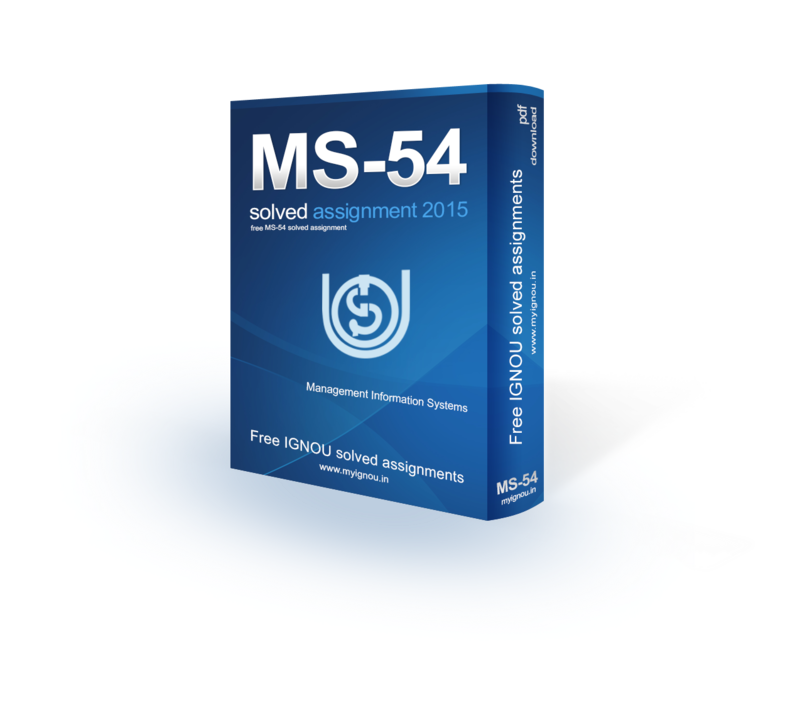 Welcome to IGNOU MS-54 Solved Assignment 2015 download section of myignou.in. Here you will be able to download IGNOU MBA & MP MS-54 (Management Information Systems) Solved Assignment for (January - June) 2015 session for free exclusively on this website. To get other solved assignments like our facebook page. Q1. What is the role played by business information in an organization? Define Management Information System and discuss various characteristics expected of a good MIS. For many companies, email is the principal means of communication between employees, suppliers and customers. Email was one of the early drivers of the Internet, providing a simple and inexpensive means to communicate. Over the years, a number of other communications tools have also evolved, allowing staff to communicate using live chat systems, online meeting tools and video-conferencing systems. Voice over internet protocol (VOIP) telephones and smart-phones offer even more high-tech ways for employees to communicate. When it comes to managing inventory, organizations need to maintain enough stock to meet demand without investing in more than they require. Inventory management systems track the quantity of each item a company maintains, triggering an order of additional stock when the quantities fall below a pre-determined amount. These systems are best used when the inventory management system is connected to the point-of-sale (POS) system. The POS system ensures that each time an item is sold, one of that item is removed from the inventory count, creating a closed information loop between all departments. The days of large file rooms, rows of filing cabinets and the mailing of documents is fading fast. Today, most companies store digital versions of documents on servers and storage devices. These documents become instantly available to everyone in the company, regardless of their geographical location. Companies are able to store and maintain a tremendous amount of historical data economically, and employees benefit from immediate access to the documents they need. Storing data is only a benefit if that data can be used effectively. Progressive companies use that data as part of their strategic planning process as well as the tactical execution of that strategy. Management Information Systems (MIS) enable companies to track sales data, expenses and productivity levels. The information can be used to track profitability over time, maximize return on investment and identify areas of improvement. Managers can track sales on a daily basis, allowing them to immediately react to lower-than-expected numbers by boosting employee productivity or reducing the cost of an item. Share "Download Free MS-54 Solved Assignment 2015"
Share this page (Download Free MS-54 Solved Assignment 2015) to let others know about it!